Riders on a wildlife refuge tour got to see two interesting sights: a bobcat and a green iguana, both of which are pretty cool. This bobcat was about to have a meal, though. Riders on a wildlife refuge tour got to see two interesting sights: a bobcat, which are pretty cool, and a green iguana, which some people believe are pretty cool, too. 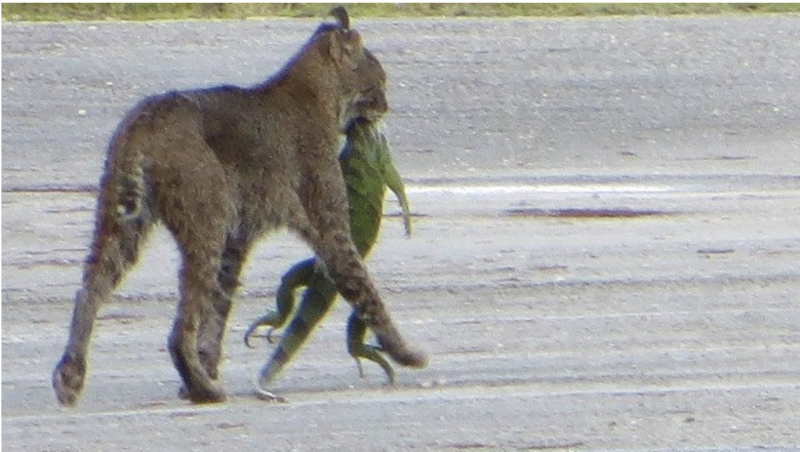 Thing is, the bobcat was about to enjoy a meal of iguana after catching the big lizard. The Arthur R. Marshall Loxahatchee National Wildlife Refuge in Boynton Beach posted on its Facebook page the photo above. Boynton Beach is south of West Palm Beach and north of Boca Raton. “Green iguanas are not native to South Florida, so this bobcat is doing good by preying on a non-native species,” the refuge's post stated. Green iguanas can live on the ground, in shrubs or in trees in a variety of habitats including suburban developments, urban areas, small towns and agricultural areas. Green iguanas are excellent swimmers and tolerate both salt and freshwater. They can submerge themselves for up to 4 hours at a time. The FWC says iguanas were first reported in 1960s in Hialeah, Coral Gables and Key Biscayne along Miami-Dade County’s southeastern coast. Green iguana populations now stretch along the Atlantic Coast in Broward, Martin, Miami-Dade, Monroe and Palm Beach Counties and along the Gulf Coast in Collier and Lee Counties. They can burrow, damage vegetation and threaten native species. Since they're not protected the iguanas can be hunted. Doing so in populated counties along the state's east coast is challenging, though, due to local regulations. While many residents have learned to live with them, trapping is a preferred means of eliminating a pesky iguana. Or, as seen with the refuge's photo, bobcats may sometimes get a few, too.